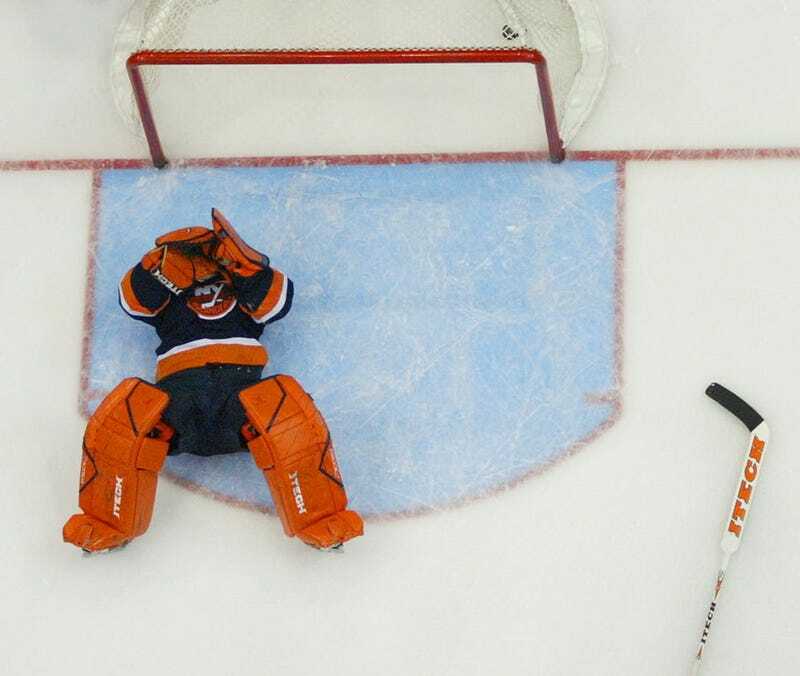 Rick DiPietro (full legal name: Oft-Injured Goaltender Rick DiPietro) may have come to the end of the road on Long Island. The Islanders put him on waivers today after he made just three starts this season—all multi-goal losses—and an era has come to an end. There's a chance DiPietro could be claimed on waivers—no, actually, there's not. He still has eight years remaining on that contract. He's headed to the Bridgeport Sound Tigers, the Islanders' AHL affiliate. Newsday reports there's no plan to bring him up again this year. But, thanks to the new collective bargaining agreement, the Isles are still on the hook for DiPi's cap number. That's a prorated $3.6 million hit, not a big deal for a team that's struggling to get to the salary cap floor. It's unlikely DiPietro will have to spend his life until 2021 living in Bridgeport, the Detroit of New England. The Islanders could use one of their amnesty buyouts this summer, as negotiated into the CBA. But they'd still owe him two-thirds of what's left on his deal, meaning Rick DiPietro won the lockout.